There are events like natural disasters, power outages or job loss that can hinder you from buying food when you most need it. That it is why it is important to have an emergency food supply. All you need is just a few days without water to die of dehydration or 21 days without food to starve. Yet, many are hesitant to stockpile food for such emergencies due to budget restraints. 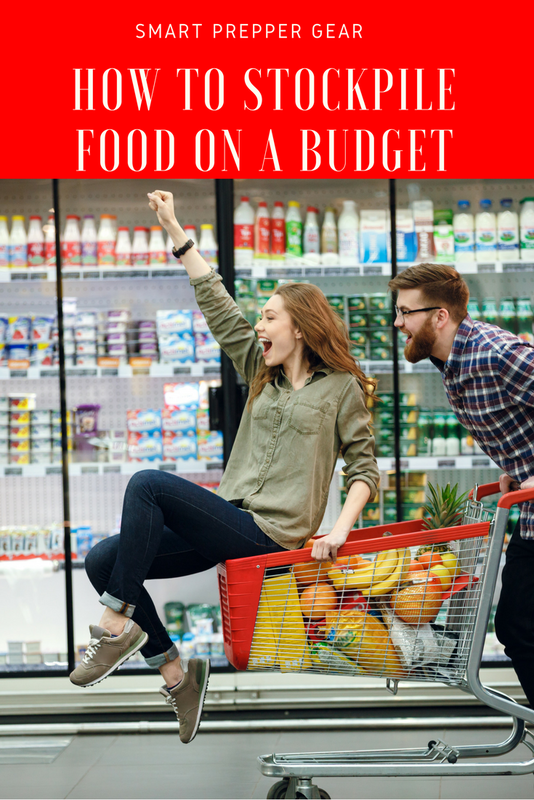 In this post, I am going to share how to stockpile food on a budget. When you first consider how to stockpile food on a budget you should put together a list of cheap foods needed. This food should be something that you and your family would enjoy. The food should also have a long shelf life. With longer shelf life it reduces the need to rotate the food out and buy more. Foods with long shelf life are generally going to be canned and packaged foods. Of course, fresh foods like meats or produce by itself doesn’t have a long shelf life. However, you can preserve them to increase their shelf life. Another option to keep in mind when you consider how to stockpile food on a budget is buying in bulk. When you buy in bulk the price per item is noticeably cheaper. You could save up over time. Then once you have enough you can visit bulk order stores like Sam’s Club. Even Amazon is now selling groceries in bulk online. This point is opposite of the previous point. Instead of buying a whole lot at one time you can buy a little bit over time. In the long run, it may be more expensive than buying bulk. However, it will help to ensure that you will at least have some sort of emergency food in your pantry at the time. When I first began stockpiling food I would set aside $30 a week dedicated to that only. So every week I would grab a few cans for emergency supply while also shopping for my regular groceries. Over time I was able to build a 6 to 8 month supply of food. Farmer’s markets typically sell food a lot cheaper than what you would find at the grocery store. However, it is mostly fresh food. So you won’t find much-packaged food with long shelf lives. One thing that you will need to do is preserve those foods. A canner may be a pricey investment upfront but will provide returns in the long run. Another option is to freeze dry those foods as well. When you consider how to stockpile food on a budget it seems impossible when we look at the prices of big name brands. We typically stick to the name brands because of the reputation of quality and brand loyalty. Many of us only eat certain brands because we were raised on them and know nothing else. However, many generic store brands provide just as much quality. A lot of times the generic brands get the food from the same sources as the big name brands. Big name brands will just slap their label on the products and increase the price. So essentially you are only paying for the label. In a previous post, I mentioned a nice app that provides you with cash back when shopping online. Now you may not think that you can buy much food online. Surprisingly you can. There are stores like Amazon that you can buy canned food and they will ship it to you. Many times it is a lot cheaper than what you would pay at a grocery store. Furthermore, you can buy some of these products in bulk as well. There are also other sites like Emergency Essentials where you can buy emergency food as well. The really great thing is that you can enable the eBates app on your web browser and earn cash back. Since I do a lot of shopping online there have been months where I receive $100 to $200 in cash back. On top of that you, if you refer family and friends to use eBates then you can earn referral bonuses. The more that you refer the higher your bonuses will increase. So it is an easy way to save money while building a stockpile. Surprise! Couponing isn’t just for women. Yes, I coupon and enjoy it too! The thrill of saving money is like a drug sometimes lol. There have been times where I bought $200 worth of groceries but only paid $40 bucks for it. There have also been times where I didn’t pay anything for groceries by using coupons. On top of that, I will get multiple items for one product to stockpile. To get started you will need to file away coupons that you receive every month. To add to your stockpile I would recommend buying 2 or 3 newspapers with coupons per week. Get folders for a bin with each folder assigned a particular month. Every time you get a paper with coupons then place them in the folder for the month that you received them. Then you should use a website like TrueCouponing.com that alerts you every week of when to use those coupons. There are cycles or seasons where certain foods are the cheapest to buy. True Couponing will let you know when they are on sale and what coupons to use on them. You are able to use manufacturer and store coupons on top of sales. This is what is called stacking. That means you are getting 3 discounts on just one product. Using group deals is another option to use when you consider how to stockpile food on a budget. Stores like Emergency Essentials provide group deals. Basically, a group of people can put money in together to buy in bulk. As I mentioned earlier, buying in bulk decreases the per item cost. Living self-sufficiently isn’t always possible for a lot of people that are an apartment or urban prepper. This is due to the limitation on space and land. However, the cheapest way how to stockpile food on a budget is by living self-sufficiently. Living self-sufficiently includes growing, hunting and raising your own food. This should be the ultimate goal of every prepper. The less dependent we are on others the higher our survival rate increases. The downside is that you will need some land. However, even apartments have patio space that will give you the ability to grow some foods. You, of course, would need permission from your landlord to do such a thing. You may only be to grow a few plants but it is better than nothing. In order to build a stockpile, you will need quite a bit of food especially if you are living off of that food. With the extra food, you can use a canner, dehydrate or smoke it. This is not only useful for food that you grow but the food that you hunt as well. 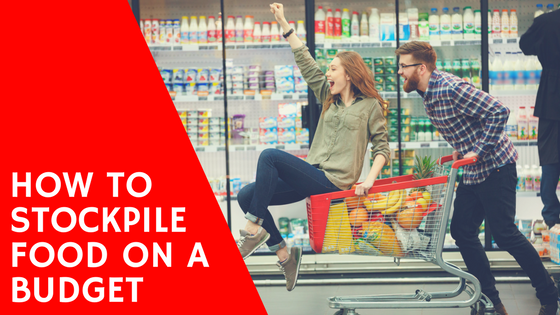 Altogether these would be my tips on how to stockpile food on a budget. If you can have any questions or suggestions then leave it in the comment section below. Your feedback helps the community prepare the smart way now so that we can thrive later.